Saturday March 23rd 2013, and as second ice age creeps inexorably upon us, the faded decadence of Oldham Street in Manchester Town feels a little more faded and decadent than it usually does. We all need cheering up think I….texts are swapped with J Coupe and arrangements are made to meet SD for evening of fun. 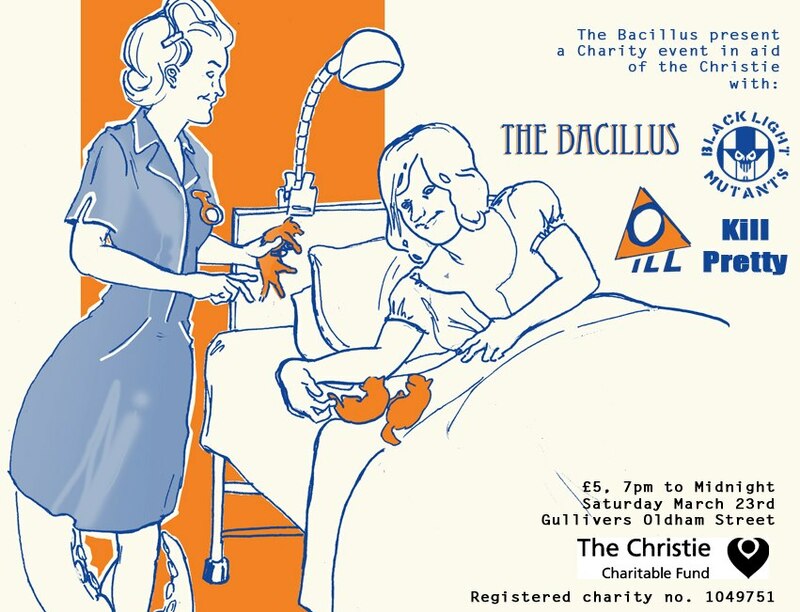 And so he we are again at Gullivers with a tasty selection of music to listen to – all put together by Aiden Cross of The Bacillus in order to raise money for Christies and in tribute to his late mother. And for those of you who into spotting these sorts of things there were four ex-Fall members, two Rapid Pigs, two Factory Stars/Blue Orchids, two Monkeys in Love, a James, a Gnod, an AAAK and various other luminaries from the rock and roll scene around these parts, in the audience or on the stage. First up is Stephen Sarsen who is described as “a prolific singer-songwriter, frontman with Frank Is Dead, and ex-bassist with The Bacillus”, who performed a solo acoustic set to begin the evening. Stephen writes very good songs and his performance is effortless and very endearing. Note made to self to check out his work further. Next the Black Light Mutants in complete contrast – which sets the tone for the evening of variety – in between Mr Coupe and myself wander over to the Castle for a pint of Robinson’s but the place is a tad full so back over to Gullivers again where there is at least a little oxygen to spare. A chat with the sound man reveals he has no CD player so the planned entrance music for Kill Pretty is sadly abandoned. Anyway Black Light Mutants are impressive and deliver their brand of anarcho punk with some vigour and venom. The use of synthesis in this context is impressive and the slower numbers are full of great imagery – both aural and visual. Then we have Ill – and a bit of a revelation for me – based on their material I had heard to date I was expecting something a little different. What we did get was a mesmerising and hypnotic 40 minutes of music floating somewhere between Can, Faust and the New York down town scene of the early 80s. Building around the impressive rhythm section of Fiona Ledgard and Whitney Bluzma the band create a marvellous, almost shamanic, sound which draws the audience in and batters them into submission. Problems with the keyboard sound, and lack of definition on the vocals does create a degree of disappointment but you would be advised to catch them live at some point as I think they are something special. And then the return, after a three month break, of Kill Pretty. And it is as if they had not been away. For a man who had major heart surgery a few weeks ago Ian Moss is looking pretty damn good and the Duttons and MJ Leigh are in astounding form playing 13 moons, Rob A Bank, Stress, Kill Pretty (the song), Breakdown Man, Emperors New Clothes, Love Twists and a mammoth reading of Dark Heart. Audience participation is inevitable and expected and the band build to an exceptional climax. The only down side is that Moet’s vocals are mostly inaudible for about half of the set but the band battle on regardless. Ian looks energised and pleased delivering an outstanding performance given his recent health issues. For a band that has not had chance to rehearse I have to say this was one of their better performances. And to conclude the new three piece The Bacillus who perform a sterling set with a handful of new material and some of the excellent songs from the first album. For some reason the sound of the band is fuller than when it had more members – Aiden should be rightly pleased with this new line up as they delivered an excellent set. All in all a very good evening , slightly affected by a lack of oomph in the PA which lead to dominance in the bass and drum area and a general muddiness. Congratulations to Aiden for pulling it all together. Posted on March 24, 2013 March 24, 2013 by HalfEdgeMediaPosted in Gig ReviewTagged Black Light Mutants, Ill, Kill Pretty, Stephen Sarsen, The Bacillus. Next Next post: Superstars, Everyone…..